For other people named Frank Reynolds, see Frank Reynolds (disambiguation). 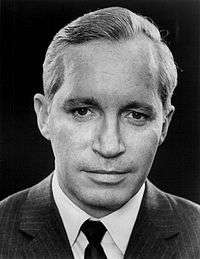 Reynolds was a New York-based anchor of the ABC Evening News from 1968 to 1970 and later was the Washington, D.C.-based co-anchor of World News Tonight from 1978 until his death in 1983. During the Iran hostage crisis, he began the 30-minute late-night program America Held Hostage, which later was renamed Nightline. Born in East Chicago, Indiana, Reynolds attended Bishop Noll Institute in Hammond and Wabash College in Crawfordsville. He was a member of Lambda Chi Alpha fraternity. Reynolds served in the U.S. Army during World War II; he was a staff sergeant (E-6) in the infantry and was awarded the Purple Heart. After the war, Reynolds began his broadcast career in Indiana with WWCA-AM in Gary. Reynolds was a television anchor in Chicago, first on the original WBKB in 1949, which in 1953 would become WBBM-TV, the CBS owned-and-operated station; he also served as Chicago correspondent for CBS News. In 1963, he moved to the second WBKB, an ABC owned-and-operated station (now known as WLS-TV) and served as their main news anchor. Reynolds joined ABC News in 1965 as a correspondent. By 1968, he became co-anchor of the ABC evening newscast with Howard K. Smith, who remained as co-anchor after Harry Reasoner was hired from CBS to replace Reynolds in December 1970. After the demotion, Reynolds returned to the field as a correspondent for the network. After Reasoner and Barbara Walters ceased their anchor duties in 1978, Reynolds returned to the anchor chair as the Washington, D.C., anchor for the now-revamped World News Tonight newscast, with co-anchors Max Robinson and Peter Jennings, who became the show's sole anchor after Reynolds' death. All three are deceased: Robinson died of AIDS in 1988 and Jennings of lung cancer in 2005. Reynolds was also the original anchor of "America Held Hostage", a series of special reports seen weeknights at 11:30 p.m. (10:30 p.m. Central Time) on the Iran hostage crisis in November 1979 that evolved into the newsmagazine Nightline in March 1980. Reynolds, still an evening news anchor, soon tired of the grind of the extended hours and was replaced by one of his revolving substitutes, Ted Koppel, then the network's chief diplomatic correspondent. One famous moment in Reynolds' career occurred on March 30, 1981, during live news coverage of the assassination attempt on President Ronald Reagan. Early reports received by his newsroom had indicated that press secretary James Brady and others had been shot, but that Reagan was uninjured. He became upset when a report arrived indicating that Reagan had been struck and at one point can be heard shouting at an individual off-screen to "speak up" as more information arrived. "Let's get it nailed down ... somebody ... let's find out! Let's get it straight so we can report this thing accurately!" Reynolds was diagnosed with multiple myeloma in early 1983, and had been absent from his anchor position since April 1983. His death on July 20, 1983 was attributed to acute viral hepatitis. One of Reynolds' five sons is CBS News correspondent Dean Reynolds. Coincidentally, it was a report from the younger Reynolds while he was a correspondent for UPI which first revealed that Brady was still alive, leading to the aforementioned outburst from the elder Reynolds. Reynolds' last broadcast was April 20 and despite promises of his return by substitute anchormen, he never did, dying from hepatitis-induced liver failure at Sibley Memorial Hospital on July 20, 1983, at the age of 59. He was diagnosed with multiple myeloma while he was being treated for acute hepatitis. Reynolds had injured his upper left femur in the Florida surf in January while on vacation and fell on it after slipping on ice in a mid-February snowstorm. X-rays showed a hairline fracture and he underwent surgery on March 17 and was diagnosed with hepatitis a month later. Reynolds, an Army veteran wounded in combat, is interred in Arlington National Cemetery in Virginia. President Reagan and wife Nancy were among the 1,100 at the funeral at St. Matthew's Cathedral in Washington. Pope John Paul II sent condolences to the family by a letter from the Vatican, read by Bishop Edward John Herrmann. In 1985, Reynolds was posthumously awarded the Presidential Medal of Freedom by President Reagan on May 23. A few years after Reynolds' death, musician Paul Hardcastle recorded a section of an ABC documentary about the Vietnam War, that included narration by Reynolds, and later used it as part of his 1985 U.S. Top 40 and U.K. #1 (5 weeks) hit, 19. Hardcastle had a video made of the song that included footage from that documentary that ABC later demanded be removed. The ABC footage was later replaced with stock footage, but Reynolds' voice remained on the recording. 1 2 3 Prial, Frank J. (July 21, 1983). "Frank Reynolds, ABC newsman, dies". New York Times. Retrieved December 20, 2015. ↑ "Reagan, colleagues pay tribute to Frank Reynolds". Montreal Gazette. UPI. July 21, 1983. p. D8. ↑ "Frank Reynolds: 'caring reporter'". Lakeland Ledger. Florida. Associated Press. July 21, 1983. p. 9A. ↑ "ABC's Frank Reynolds dies at 59". Bangor Daily News. Maine. Associated Press. July 21, 1983. p. 25. 1 2 3 "Reagans join 1,100 in saying goodby to Frank Reynolds". Milwaukee Journal. Associated Press. July 1983. p. 5, part 1. ↑ Archived September 20, 2005, at the Wayback Machine. ↑ Reddicliffe, Steven (May 7, 1980). "'Nightline' a hit in late-night spot". Boca Raton News. Florida. Knight-Ridder. p. 8C. ↑ Bark, Ed (March 20, 1990). "After 10 years, Koppel, 'Nightline' still going strong". Boca Raton News. Florida. (Dallas Morning News). p. 4C. ↑ Perkins, Ken Parish (August 1, 2004). "Show is waning, but the need for it is not". Gainesville Sun. Florida. Knight Ridder. p. 1D. ↑ "First ABC News Bulletin - President Reagan assassination attempt shooting - Frank Reynolds". YouTube. 30 March 1981. Retrieved 21 June 2012. ↑ "Dean Reynolds". CBS News. September 25, 2007. Retrieved December 20, 2015. ↑ Archived November 14, 2006, at the Wayback Machine. ↑ Clark, Kenneth H. (July 21, 1983). "Burial at Arlington for Frank Reynolds". Chicago Tribune. p. 10, section 2. ↑ Vick, Karl (June 21, 1983). "ABC feeling after effects of Frank Reynolds' illness". St. Petersburg Times. Florida. p. 1D. 1 2 "ABC newsman Frank Reynolds buried in D.C.". Pittsburgh Press. UPI. July 24, 1983. p. A16. ↑ "Reagan presents Medals of Freedom to 12". Toledo Blade. Ohio. Associated Press. May 24, 1985. p. 7. Wikimedia Commons has media related to Frank Reynolds (journalist).